If you’re like many people, you’ve seen motorhomes on the road and wondered what it would be like to spend an extended summer vacation touring the country in an RV. Or if you’ve already been on several RV trips (maybe even own an RV), I bet the thought of selling/renting your house and embracing the full-time RVing lifestyle has crossed your mind at least once. 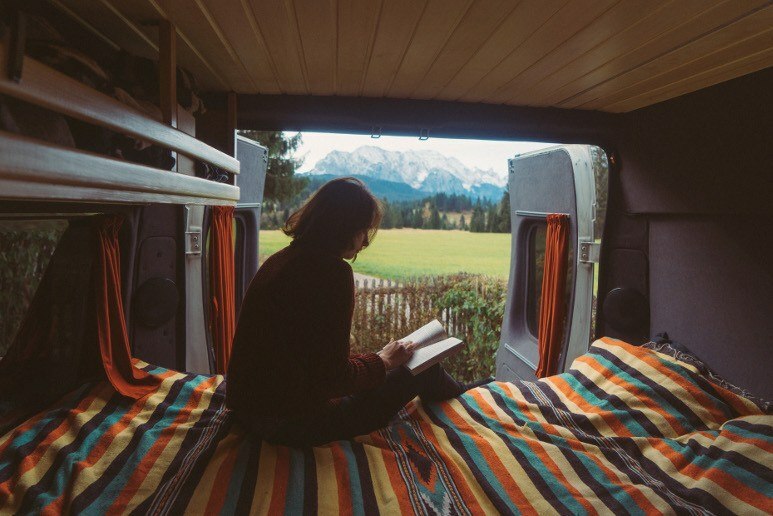 If you’ve ever seriously considered spending a few months, or even a couple of years, in an RV, these six books will prepare you for the journey, giving you a taste of what it’s like on the road, sleeping on an RV mattress every night. Bob Wells knows what he’s talking about after having lived in a vehicle for more than ten years. This dual-purpose book covers those who are forced to live out of a vehicle due to a downturn in the economy as well as those whose American Dream is to live a life untethered to one location. With more than 100 tips, it would be difficult not to find something useful in this book. It addresses the planning stage, when people ask themselves if they can afford to live in an RV. Written by a former editor of RV View magazine, this comprehensive guide covers the different kinds of RVs, tips on buying, driving advice, and more. If you’re interested in the RV lifestyle but have no idea where to start, this is the book for you. In this practical guide, Ms. Hall Bruzenak explores ways to make money while traveling in an RV. Her book gives ideas for more than 300 job and/or moneymaking opportunities that can be picked up in communities all across the country. This guide focuses on the lifestyle and financial aspects of RV owning specifically for people who are retired or approaching retirement age. It addresses topics including traveling with pets, different approaches to towing a car, and how to access health care on the road. We honestly can’t think of anyone who wouldn’t be fascinated by this beautifully-illustrated book. If you intend to make the most of your RV travels without being restricted to overcrowded, “touristy” destinations, this book is a must-have.